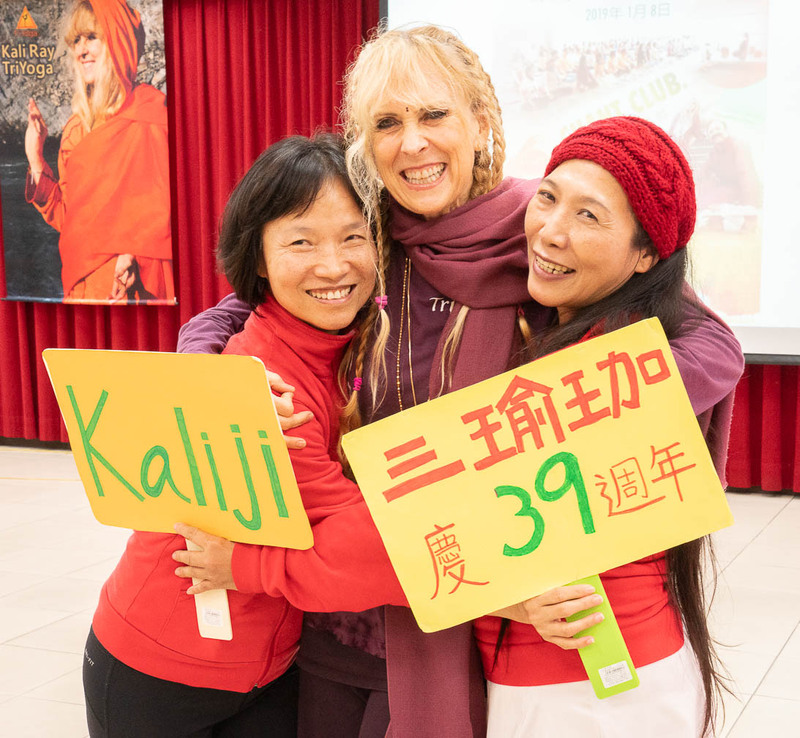 After departing mainland China, Yogini Kaliji continued TY39 celebrations with a two-day visit to Taiwan which included a full-day event of TriYoga and Chant Club on January 8 at the Chientan Activity Center, plus a workshop at TYC Taoyuan the following day. TriYoga and Chant Club were warmly and enthusiastically welcomed at the airport with signs, songs, hugs, and many photos. Kaliji offered a perfectly paced six-hour TriYoga workshop. Chant Club performed in Taiwan for the first time! Afterwards, the audience heard demos from Chant Club’s upcoming debut CD. New Basics teachers, recently certified in Taipei after a TY teacher training at the Okido Yoga Association. Level 2 teachers, newly certified at TYC Taoyuan on December 26 after the completion of the first Level 2 TYTT in Taiwan. 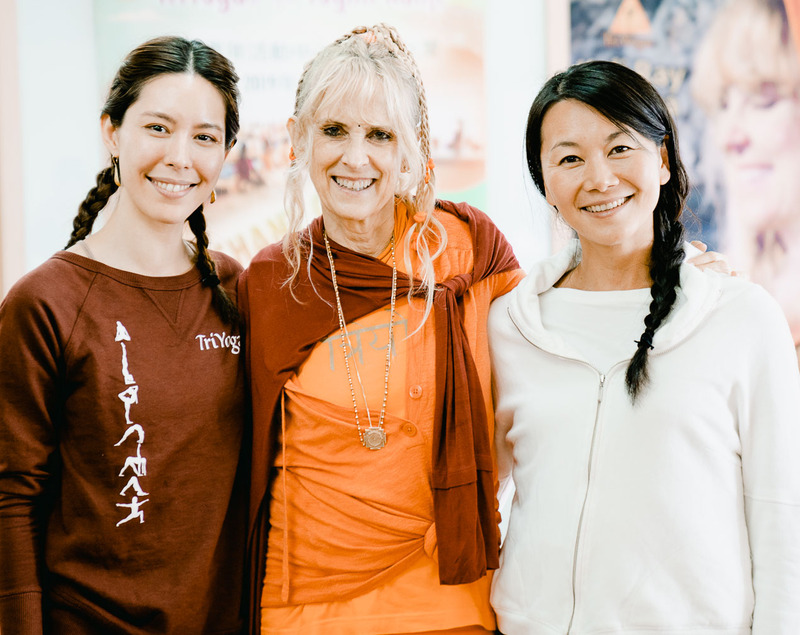 Xiao Mei-Jiao, President of the Republic of China Yoga Association—the largest yoga association in Taiwan—visited the class to meet Kaliji and invite her to present during the International Yoga Day this June in Taiwan. Mr. Lin has been a friend of Kaliji and TriYoga since Kaliji’s first visit to Taiwan in 2004 through an invitation from the Taiwan Okido Yoga Association. Huang Fu-Mei (in purple) is the current president of Taiwan Okido. Ms. Lin, president of the Taipei Antiques Association and Mr. Tsai, past president of the Bonsai Association of Taipei. 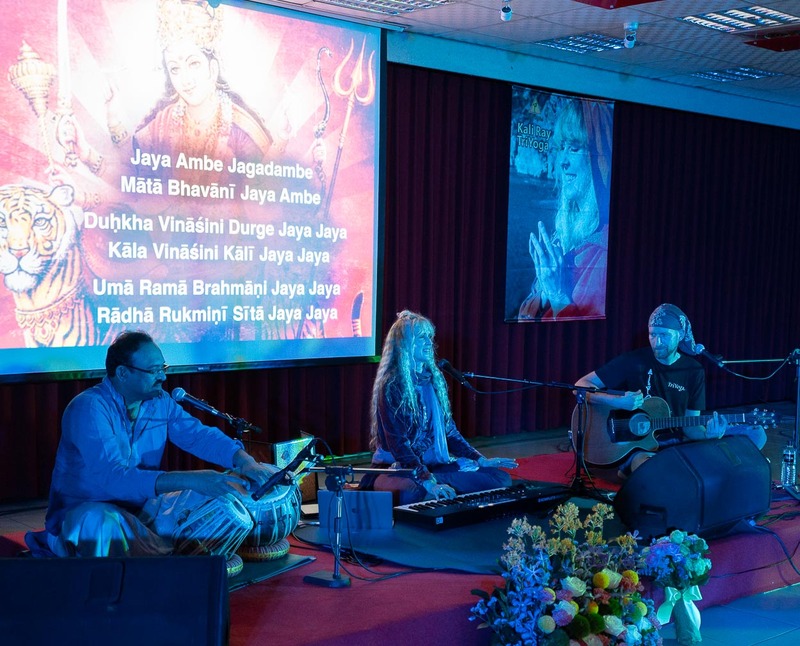 They assisted with antiques and bonsai for Dr. Sri Ganapathy Sachchidananda Swamiji’s concert in Taipei on December 31, 2017. TY Basics teacher Cheng Chuan-Chuan and her husband Chen Ming-Zhi (Meiji) met Kaliji on a train in Taiwan in December 2017. Chuan-Chuan then joined a Basics teacher training in Taipei and certified in October. Teachers and students from across Taiwan, plus China, Japan, and Austria, traveled to Taipei for TriYoga and Chant Club. Kaliji taught a three-hour TriYoga workshop and joined a vegan meal with students at TYC Taoyuan, about 40 minutes south of Taipei. Rishi, Santoshi, and Ganga offered alignment assistance during classes. Kiki provided Chinese interpretation. Julia, junior-level TYTT and director of TYC Taoyuan, was TriYoga and Chant Club coordinator for this excellent visit. A group bid farewell at the airport. While in Taipei, Kaliji enjoyed a meal at Miss Green vegan restaurant.